They arrived outside St. Mary Parish rectory practically incognito: 13 smiling clergy and laypeople wearing sun glasses and bike helmets and ready for the Bishop’s Bike Ride. Their bright T-shirts, jerseys, shorts and some spandex looked perfect for bicycling, but nothing you’d typically see at the chancery or in the parish. 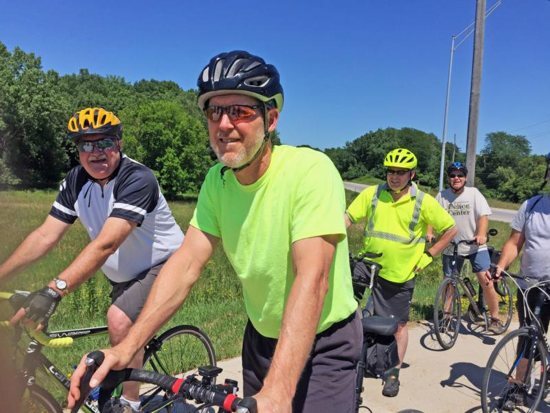 The July 6 ride served as a cycling send-off for Davenport Bishop Thomas Zinkula, spiritual director of the “Pedaling to the Peripheries” team for the Register’s Annual Great Bicycle Ride Across Iowa. Best known as RAGBRAI, the event starts July 22 in Onawa and ends July 28 in Davenport. Bishop Zinkula sees RAGBRAI as an opportunity to go out to the peripheries, like Pope Francis, to encounter people and to set an example as a joy-filled Catholic. He’ll be dressed like everyone else, but his role as bishop of the Diocese of Davenport probably will come up in conversation. If people have questions, he’ll be glad to provide answers. He’ll also celebrate Mass at a parish in each town that serves as an overnight stop. Father Witt, whose parish hosted the event, designated Father Bill Roush to lead the cyclists. Father Roush, pastor of parishes in Riverside, Richmond and Wellman, took the assignment with gusto. One of the cyclists casually asked if he works out on a regular basis. The wiry priest smiled. Father Jeff Belger, director of the Newman Catholic Student Center in Iowa City, experienced his share of mechanical challenges. He had a flat tire — before the ride started. He repaired the flat in no time, with assistance from Father Dan Dorau, parochial vicar of Divine Mercy Parish in Burlington and St. Mary Parish in Dodgeville. Later on, the chain on Father Belger’s bicycle broke. He managed to coast back to the rectory where a feast awaited the cyclists. Arland-Fye is editor of The Catholic Messenger, newspaper of the Diocese of Davenport.